I found the timetable of this year’s festival to be very poorly planned, placing artists of similar style and genre at the same time resulting in myself and my boyfriend running between stages or skipping artists entirely. Regardless of these clashes, I managed to see Papa vs Pretty, Sticky Fingers, SAFIA, Allday, Dan Sultan, Megan Washington, Art vs Science, Hayden James and RUFUS before leaving the festival two hours prior to it finishing as we weren’t huge fans of Illy or The Amity Affliction. Comparing my festival experience to previous years, it wasn’t my favourite festival experience but I still thoroughly enjoyed the day! This was a band that I had not previously listened to, however my boyfriend was into them so we ended up on the barrier for them. 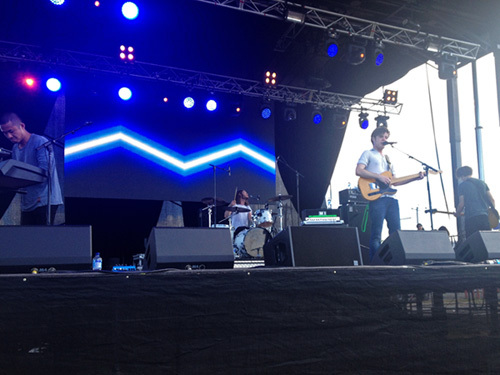 I thoroughly enjoyed their set – they had a cool indie pop vibe (which I’m super into) and seemed like pretty cool guys. The crowd that gathered was pretty small, as they were only the second artist to play the festival, which was sad. Two days later, Papa vs Pretty decided to call it quits as a band, with River Sessions Festival being their last ever show. Such a shame to see such a good band break up 😦 Papa vs Pretty were certainly contenders for my favourite artist of the day! 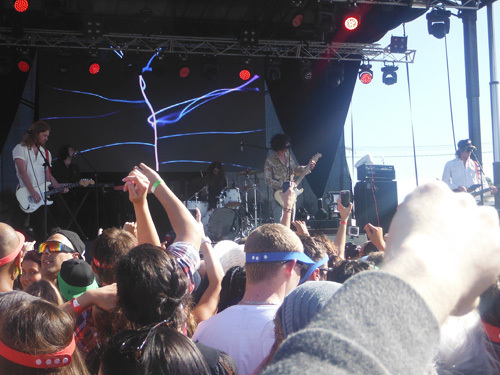 After standing in the midday sun for an hour at Papa vs Pretty, we dropped to the back of the crowd for Sticky Fingers’ set while we applied sunscreen. The band were not outstanding live, despite every member looking like they came straight from the 80’s. Yet again, I had not heard much from Sticky Fingers prior to the festival with the exception of Caress Your Soul – a song that was voted #61 on Triple J’s Hottest 100 songs of 2012. Sticky Fingers were certainly not a festival highlight for me and were rather a time filler before our next artist. After a very long wait due to technical difficulties, I was surprised at how young the boys from SAFIA looked considering their success in securing supporting act for Lorde on her Australian tour. Their set was fun and had the crowd dancing – however, since rapper Allday was playing after them, the crowd was mostly fans of him which resulted in them chanting “Allday” in the middle of SAFIA’s set. This really ruined the mood for me as I realized that most of the crowd actually wanted SAFIA off the stage. They closed their set with their Hottest 100 of 2013 hit “Listen to Soul, Listen to Blues” (or, as I hear it: “I Listen to Sorbet” – seriously! ), which I found to be a great choice. 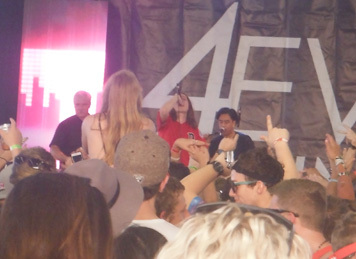 After SAFIA finished, Allday’s crazy fans began to pile into the small area where the 4eva Young stage was. We retreated to the back of the area to watch from a distance. I wanted to see Allday purely because of the hype around him, having missed seeing him at Groovin’ The Moo 2014. Once he started, though, it was clear that the hype was for no good reason. His opening song was terrible and barely audible above the adoring screams of his teenage fans, which he quickly followed with his Hottest 100 of 2013 hit “Claude Monet”. Usually, I would be against an artist playing their biggest hit so early in the set – however, this allowed us to leave his set early and still catch a good song of his. As soon as Claude Monet concluded, we were out of that crazy pit and off to the other stage. The police surrounding the crowd during Allday told us that it was not going to be a calm and enjoyable set. Having watched Dan’s live set from Triple J’s One Night Stand on TV one night, I did not have him on the top of my to-see list at this festival. Aside from Under Your Skin, I found his songs average. However, he was certainly a welcome break from Allday and provided ample opportunity to sit in the shade of the setting sun and chill out for a while. Dan also played his big hit early in the set, but I still found his remaining songs somewhat enjoyable. 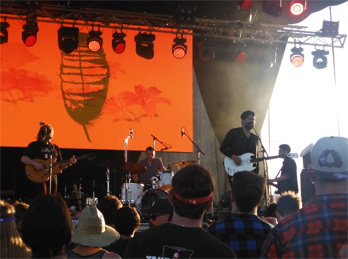 Dan Sultan is certainly an artist that is more enjoyable live in the right atmosphere than through a television screen. I’m not really sure how I can describe Megan Washington’s performance in words. After Dan Sultan ended, we seized the first barrier position we could see and secured our front row spot for the next few hours, and I do not regret it one bit. Megan was perfect, mixing old hits with new, unreleased songs whilst simultaneously giving the audience an insight into her personal life and the background behind the songs. She sung with passion and the beautiful tone of her voice held its ground against the loud instrumental arrangements that can overpower other artists. Megan was quirky, consistently dancing energetically, in addition to embarrassingly missing a kick aimed at a beach ball thrown onto the stage – twice. My only downside to Megan’s performance was the absence of my personal favourite of hers – “Holy Moses”. All in all, Megan Washington easily secured the title of my second favourite performance of the festival. Man, oh man. I am so glad that this set went overtime. We kept our barrier spot (albeit with slightly less standing room) following Megan Washington to be front row for Art vs Science. One thing I initially noticed about these boys that set them apart from the other artists I saw during the festival is that they set up their own stuff instead of a tech team – a giant yes! Even while setting up, Dan Mac and Jim kept the audience entertained with quirky warm up exercises whilst testing the equipment. The boys’ entire set was electric and very, very loud and kept the audience dancing the entire time. They were always dancing behind their keyboards and showed such a large amount of passion for their work. I was situated directly in front of Dan Mac, who showed such enthusiasm for their older stuff in addition to their newer stuff. Art vs Science played their big hits “Magic Fountain”, “A.I.M Fire” and “Parlez vous Francais” as well as some of their lesser known and newer stuff such as “Create / Destroy”. During Parlez vous Francais, the boys detoured to an impressive guitar solo in the middle of the song, which left Dan Mac standing on speakers on the sides and center of the stage as he jumped around, while Jim continued dancing energetically behind his keyboard. After a few minutes of guitar and general deviation from the original song, the boys stopped and asked the crowd if they wanted them to actually finish the song. At the conclusion of their brilliant set, Jim jumped into the crowd (too far to his side of the stage for me to get close to) and Dan Mac stood directly in front of us but did not jump in, as the security in front of the barrier were already having problems pulling Jim away. Art vs Science were without a doubt my favourite performance of the festival and the energy and happiness that their set gave me remained for the next artist of the night. Although Art vs Science’s set was longer than expected, we escaped our barrier spot (which was a difficult task due to popular headliner RUFUS being next on stage) and ran to the opposite stage to catch the last 20 minutes of Hayden James’ set. 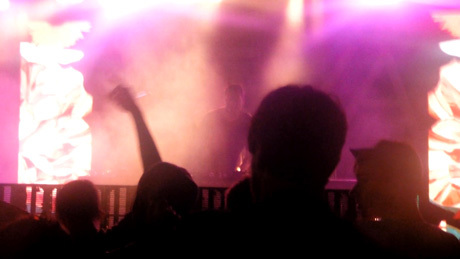 He played some pretty cool remixes of songs I knew and, despite the small crowd, had everyone dancing. He closed his set with “Permission to Love”, a song we both loved, and we made our way back to the main stage to catch the remainder of RUFUS. RUFUS was our final act of the night, and by this time we had lost all our energy. We had not eaten since 1pm by this point, so instead of joining the crowd, we sat at the back to organize dinner and rest our legs. 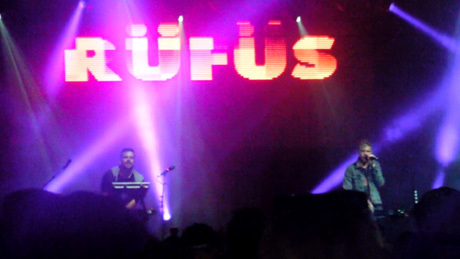 I enjoy RUFUS’ music, however I don’t see it as amazing. They have some great hits, a number of them making the Hottest 100 of 2013. Towards the last ten minutes of their set, we joined the crowd for one final dance to their song “Desert Night”. Overall, I find that most of RUFUS’ songs sound very similar, but I’m sure that if I’d stayed at the barrier I would have been caught up in the vibe that the rest of the crowd seemed to be enjoying. Although the lineup of 2014’s River Sessions Festival was below its usual standard, I still enjoyed the entire day. This year’s festival was more spacious than the last due to a lack of a separate 18+ area and there was enough grass to sit on comfortably (as opposed to last year’s festival, where we had to sit on dirt). The weather was brilliant, offering a warm day despite the festival being held in winter. Art vs Science were the act that stood out to me, followed by Megan Washington, Hayden James and Papa vs Pretty. River Sessions will certainly be a festival that I will continue to attend on a yearly basis!